Bottlebrush (Callistemon) grows easily along Australia’s southern coastline. Bottlebrush trees thrive in tropical and semitropical climates in moist areas along the banks of creeks and rivers. These plants range in size between 10 feet and 15 feet in height. Aptly named for their flowers, bottlebrush trees produce interesting blossoms on tall stalks. These flowers contain numerous fine filaments along the outer lengths of the stalks, creating an unusual appearance in flowerbeds and landscapes. The nectar of the yellow and red blossoms draws insects and birds. Enhance your landscape with a tall bottlebrush tree. Select a tall variety of bottlebrush tree to ensure an elevated size at maturity. Some of the taller varieties include willow bottlebrush (Callistemon salignus) and weeping bottlebrush (Callistemon viminalis). Choose a healthy tree with strong branches and uniform growth. Plant your new tree in the best location to encourage healthy growth. Look for an area that provides full sunlight. Bottlebrush trees require direct light to flourish and thrive. Avoid planting your tree close to other young trees that may block the sunlight as they grow and mature. Trees tend to compete for soil nutrients, so encourage tall and healthy growth by giving your tree its own spot. Remove any existing vegetation from the site with a sturdy garden shovel. Pull out any stubborn roots that remain. Dig a hole for your bottlebrush tree. Make the hole at least twice the width of the rootball and as deep as the rootball. Put the tree in the hole, making sure that the surface of the rootball is even to the surface of the soil, and fill the hole. Water your bottlebrush tree frequently to ensure adequate moisture for tall growth. Keep the soil slightly moist near the roots of your tree. These trees tolerate some periods of dryness, but thrive in moist, well-drained soils. Prune your tree in the late winter or early spring to encourage tall growth. Use sharp pruning shears or a branch saw to remove any broken or damaged growth. Cut off some of the lower limbs and crowded limbs to reduce bushiness and encourage upward growth. Help your tree grow very tall by removing any lateral limbs that extend beyond the height of the central, vertical section. Do not prune the top of the central section of your bottlebrush tree. Apply some fertilizer to promote healthy growth. 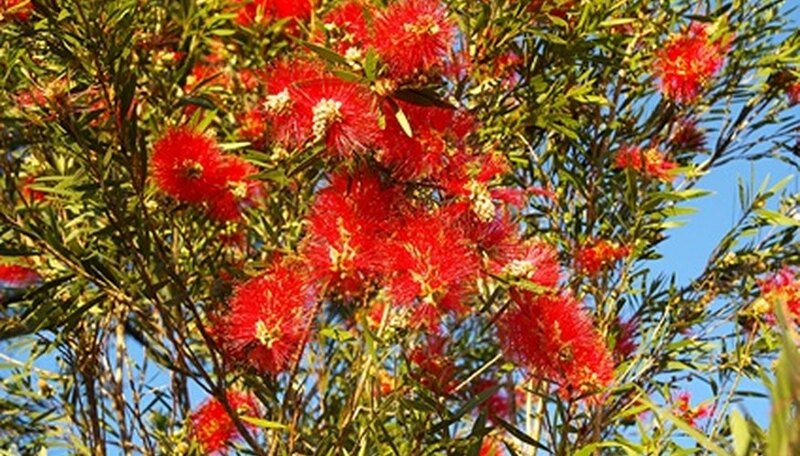 Bottlebrush trees do well with a low-phosphorous fertilizer. Apply this according to the package directions every spring and fall. Laura Wallace Henderson, a professional freelance writer, began writing in 1989. Her articles appear online at Biz Mojo, Walden University and various other websites. She has served as the co-editor for "Kansas Women: Focus on Health." She continues to empower and encourage women everywhere by promoting health, career growth and business management skills.